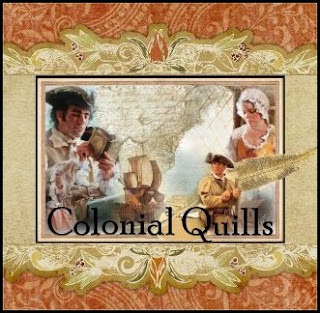 Colonial Quills: Colonial Quills Blog Launch! Hear ye! Hear ye! 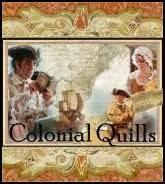 Welcome to the official launch of Colonial Quills, the blog dedicated to Colonial America Christian Fiction. This blog began as a project of the Colonial American Christian Writers group. To meet the "Quillers" please visit the Contributors Page. 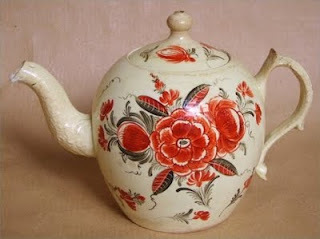 So please do have some tea, make your self comfortable and enjoy the camaraderie. We are serving both readers and writers who love this fantastic era in America's history. 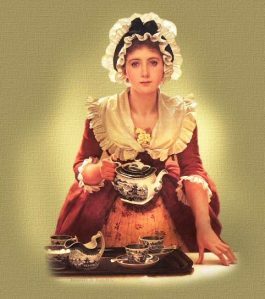 Please be sure to leave a comment and join our discussion as our blog hostess, Carrie, is giving away some tea party favors! What will you find here at Colonial Quills? Well, in addition to connecting you to writers of Colonial American Inspirational Fiction, providing a running list of publications, and some research and resource links we will have regular features each week as follows, our primary days being Monday, Wednesday, & Friday. We hope you'll visit often and get to meet some of your favorite authors and be introduced to some new ones! Colonial American fiction at it's best with excerpts to whet your palette for this engaging sub-genre. how they lived in 18th century America. on writing and researching Colonial American fiction. A bonus day. A little something extra for hearth & home. Occasionally our contributors will have something extra to share. 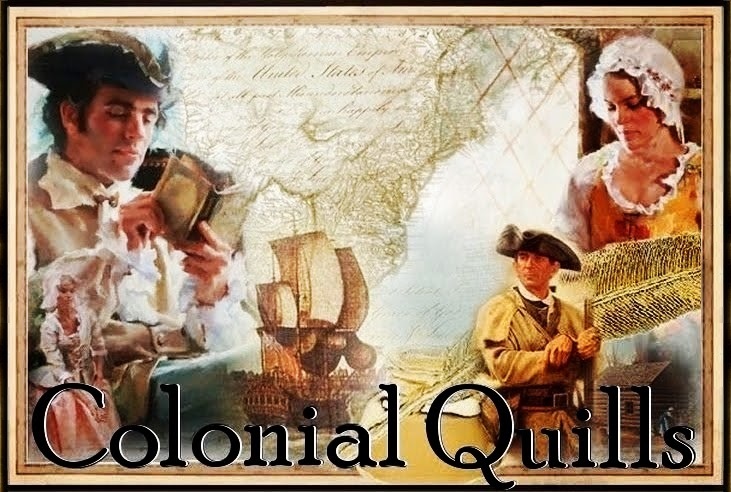 Did you sign up to follow Colonial Quills yet with Google Friend connect and to receive email updates? We sure hope you will. And we'd appreciate your spreading the word by tweeting about us (hashtag #colonialquills) and sharing our posts on facebook. Feel free to use this image on your blogs to let others know about us! In the side bar you'll also find a badge to put on your blog. DON'T MISS our first Fiction Sampler: At the Captain's Command by Louise Gouge including an introduction and excerpt to the third book in her series set during the years of the American Revolution. SEE THE FOLLOWING POST. Thank you so much for visiting us! Please leave a comment and let us know you've come by. We'd love to hear your thoughts on Colonial America and this sub-genre of historical fiction. I'm so thrilled to see the Quillers official, and honored to be a part of this fun group! Thank you so much Carla for creating this wonderful website for our group. With almost two dozen Christian writers who have colonial works, it is so wonderful to have a place to congregate with them and for our friends to join us! God bless you! And welcome visitors, pull up one of those side chairs and I will get you some tea! Or coffee for those already feeling the rebellion coming upon them! What a wonderful colonial atmosphere the blog has! I have lived in Maryland all my life, and moved to the central part of the state years ago to a historically rich area. There is so much here to inspire my writing. Welcome all to the blog! Virginia, I plan to do just that this summer! Thanks for stopping by Colonial Quills today. We hope to see you again. Thank you, Carrie! May I have some sugar and milk in my tea please? Glad you like the blog, Rita. It's wonderful to be surrounded by history ~ at home, or even in our virtual world! I'm so excited to see this blog come together. I'm looking forward to sharing and learning from everyone here. How many lumps of tea, Carla? Will be back from the cooling house in a moment with the cream. Oh, and Rita, I am giving away a copy of your book today to some fortunate colonial visitor! Be right back! Two lumps for me, please:) Such a beautiful blog! This really is a dream come true for many of us. Bless you all! What an exciting new venture, and what a great group of contributors. I wish you well as you explore all things Colonial. Laura, yes Carla helped make our dreams come true! Two lumps of fresh sugar. Caribbean I believe. Welcome Keli, and thank you. Coffee or tea? What a blessing to join you all in this wonderful venture! Thank you Gina Welborn for inspiring us to do this! Welcome everyone! The place looks great. Kudos to Carla and everyone who planned and designed our new blog. Beautiful work. I was born and raised on the east coast too (born in VA, raised in S. MD), but now live out west (in body; in mind I'm more often somewhere along the late 18th century Blue Ridge frontier!). This will be a fun place to gather for fiction lovers as well as history lovers, and I look forward to gradually compiling our collective 18C research and favorite links all in one place. Laurie Alice Eakes posting here via Carrie on the phone. We have just paid a visit to Ye olde colonial courthouse, where her spouse, a lawyer, is busily advising the judge. No coffee for him today. Tea for Laurie Alice and me. And some meat pie with chicken. Yum! We are ready to serve you all now that we have snacked a little ourselves. I will forgo the sugar in my tea, Miss Carrie, since it is gotten on the backs of our unfortunate slave brothers and sisters on the islands. Honey is fine. Please save a slice of the meat pie...just a smidgen though. And thank you for generously giving my novel 'Surrender the Wind' away to one of our visitors. What a wonderful site! Congratulations! So glad to see Karen Lange and others here! I understand Karen is from Kentucky:) It's fun to see familiar faces and names bless this blog. Back later! Blogger has been up and down today, so I will see if it will allow me to refill the tea and coffee cups and bring around the lovely silver sugar bowl and tongs that the silversmith made for us in Williamsburg. Such talented artisans they have out there! What a wonderful online presence for the Colonial inspirational authors! Your lineup of posts looks great. I signed up for email notices to remind me to check them out. Love the blog header. Blessings on your new venture! Lovely of you and Goodwife Gade to invite us all for tea. How ever could you afford it? I shall stay true to the Patriots' cause and have the chickory. I do not doubt but lamp oil will shortly become dear as well. But it appears the Quillers care naught for such trials, and forge ahead with their plan. May God bless you, ladies, and this course you have set yourselves upon! Mistress Gouge is traveling and cannot be here today...you know slow those colonial conveyances can be...but she has had the good fortune of visiting Williamsburg over the weekend and obtained some fodder for sharing with us when she posts! We shall see her soon and wish her safe travels. I saw a post on a loop dear Louise left in which she'd been to Mt. Vernon and therefore sends her regrets:) Oh, to be in her calamanco slippers! The bath tub has been filled with water heated over the fire and my sweet son is getting his bath. We are affording him some privacy with a sheet on a line in the kitchen. I fear ticks are back here in Virginia. If only they would infest the British army's camps! Indeed, Goody Pagels. Time to make some more lye soap. Thanks for visiting, Michelle! We'll be busy all week! What a wonderful time with all of you here! So glad you stopped by! Greetings, ladies. I'm so happy to be here, too. I just returned from a one-week visit to Virginia and plan to write about it later. Let me just say that VA is a wonderful state, so full of history and inspiration. Can't wait to go back one of these days. Renee you are the winner of a copy of Rita Gerlach's book "Surrender the Wind"! Congrats. Now I need to get your address. Email me at cfpwriter@aol.com. Blessings! Oops, that was Renee Ann! But I am going to send both our Renees a copy of STW by Rita. Congrats, Renee Ann, too!! What a beautiful site! Congrats Carla and everyone who had a hand in putting it together. The images... the colours... evocative of a simpler, but no less stressful time. I'm following, I subscribed, I'm enchanted! Whoever designed that gorgeous graphic at the top deserves a hugh check... or at least a pat on the back. :) Can't wait to see what all happens here. Congratulations, Quillers! What a beautiful site. I'm delighted for you. May God bless your endeavors! Thank you, Pegg. That was me (blushing...). Some of the images used were painted by the talented Meadow Gist http://meadowpaint.com. I'm so glad you like! Thank you for following! What a blessing it is to see you all here! Thank you so much for everyone for stopping by and all the nice comments you've made. We do hope that this place will inspire you and that you will enjoy the great content we have planned from our talented authors. See you soon! Hi, I'm so glad I found you! I'm currently working on a book that features my ancestor, John Perry who came to America following the Great Fire of London in 1666. I am hoping to turn it into a series that will follow the family through American History. I have been struggling to find the details of daily life that make history come alive . . . Your site is a boon to my efforts. I look forward to reading what others have written.